It’s a Saturday morning at Herring Cove Beach in Provincetown, Mass., the farthest point on the Cape. I am sleepy, hungry, and slightly dehydrated, but we are on a schedule dictated by the tides. The salty breeze wakes me up as I trudge through the sand in my steel-toed boots toward the stranded whale. Many people assume that because I work with whales, I must have a glamorous job involving being at sea with a permanent tan. In reality, I’m more likely to be swimming in whale than swimming with whales. I study hearing in baleen whales—the big, often endangered whales that include blue whales and North Atlantic right whales. We believe these whales are great listeners, possibly calling to each other over hundreds of miles. Unfortunately, it’s getting harder for them to hear each other in our increasingly noisy oceans. Imagine living next to an airport, with no doors to close and no earplugs to block the constant roar of airplanes jetting over your head. This may be similar to the surroundings of our local whales, which have feeding grounds across from Boston Harbor, one of the busiest shipping centers on the U.S. East Coast. When I was in high school, I visited one of these feeding grounds, the Stellwagen Bank National Marine Sanctuary just north of Provincetown. I went out on a research vessel for the first time and did a mini-project on noise pollution and dolphins. We recorded background noise levels using underwater microphones and compared these noise levels to what was known about dolphins’ hearing capacities. I was a participant of the Aquanaut Program, funded by the National Oceanic and Atmospheric Administration to get high school students interested in science. Sure enough, I got interested. I also learned that if I wanted to investigate the effects of noise pollution on baleen whales, I couldn’t because we lacked basic data on what range and frequencies they can hear, and even how sound gets to their ears. The large size and inaccessible habitat of whales make them hard to study. We get few specimens with which we can learn about their anatomy, and little time because their tissues decompose rapidly after death. So what and how whales hear has remained a research frontier. A decade later, I am in graduate school trying to get inside the heads of baleen whales—literally. 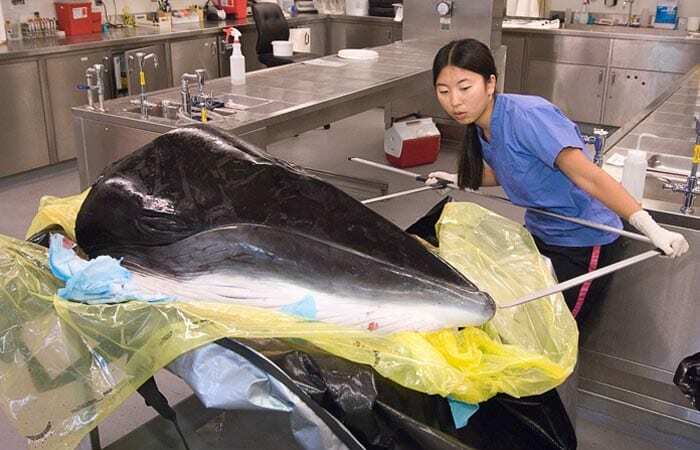 I dissect dead whales that stranded on the beaches of Cape Cod, working closely with the International Fund for Animal Welfare’s Marine Mammal Rescue and Research group. I examine the auditory anatomy to gain some clues about how sound travels from the ocean environment to their inner ears, how their ears function, and what frequencies they can hear. I also extract the ears, which are about the size of softballs. This requires sharp butcher knives, hammers, and chisels, as well as lot of practice and patience because these are delicate structures firmly lodged inside the skull. Even though I’m focused, it’s also important to stay alert to my surroundings so I don’t slip on a stray, slimy body part, fall into a pile of intestines, or get whacked in the head with a sheet of blubber being transported by heavy machinery. Manipulating a 40-foot whale weighing 10,000 pounds is not easy. I always loved dissections in biology classes, even after my middle school lab partner accidentally squirted frog juice into my eyes. It is amazing to reveal all of the inner components of an animal that work together to sustain life. Plus, if you’ve ever wanted to get close to a whale, this is as close as you can get. But this is not a pretty job. 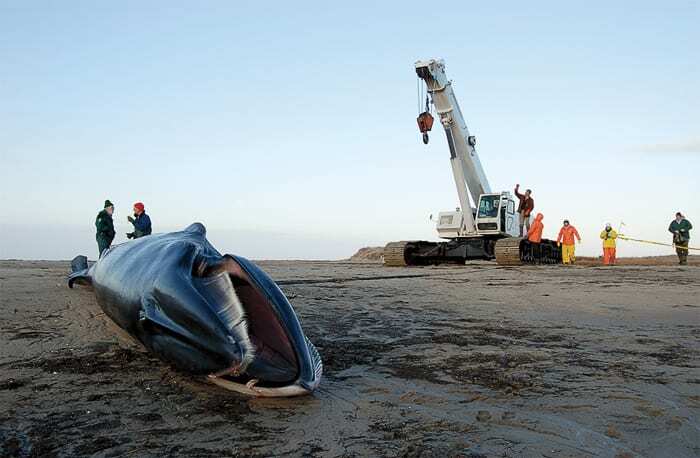 Dead whales have a distinct, sickly sweet stench strangely similar to the scent of putrid fruit, with a hint of vomit. Whales are also large, which means they have a lot of blood and guts. Most of us wear overall-style foul-weather gear so we don’t get soaked. With unflattering clothes covered in blood, hair flying in the wind, and runny noses that can’t be wiped, you never look good during a whale dissection. 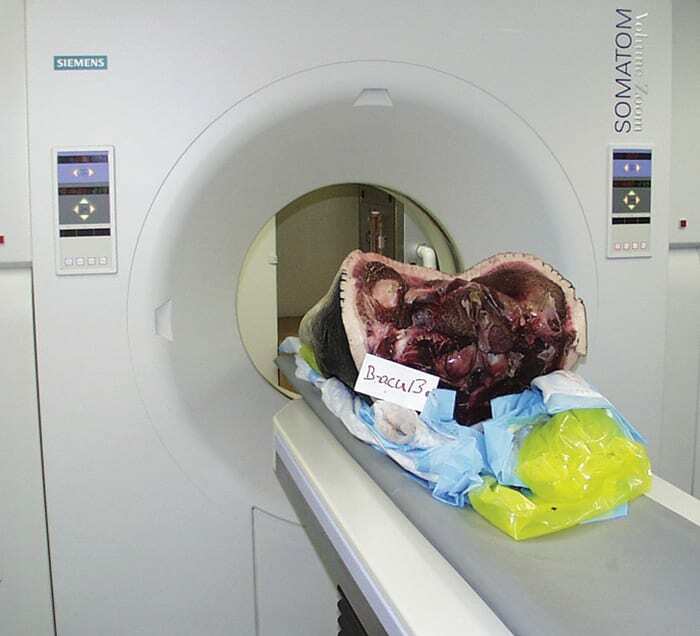 Looking at the “gross” anatomy can tell us about sound reception pathways in the whale head. If the whale head weighs less than 1,000 pounds, we investigate it at the CSI lab at WHOI—that is, the Computerized Scanning and Imaging lab. If it weighs under 500 pounds, we put the whole head through our CT scanner. The CT data allow me to create three-dimensional visualizations of the internal anatomy of whale heads even before we dive into the dissection. This is particularly useful because the shapes and relative orientations of the soft tissues are inevitably distorted as soon as you cut into them. How sound gets from the aquatic environment to the inner ears of cetaceans is a question that has been debated for centuries. A major breakthrough came in 1964, when scientist Ken Norris realized that the unique fat bodies associated with the lower jaws of dolphins may provide a pathway for sound to travel to their ears. Today, his theory is widely accepted for toothed whales, including dolphins and porpoises. But the question is still unresolved for baleen whales. By applying new biomedical imaging techniques to old questions, I’m advancing an area of research that has seen little progress in the past several decades. Looking at the anatomy can tell us about the pathways through which sound travels through the whale head. 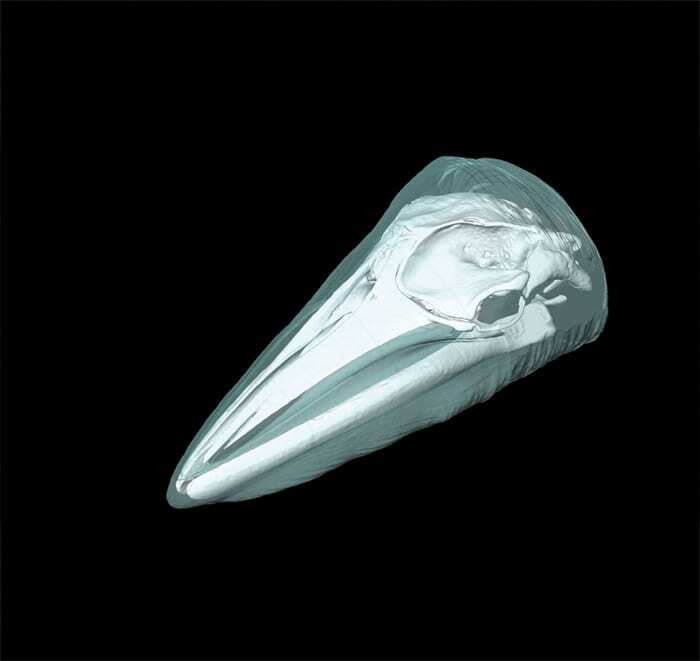 However, to get a handle on what kinds of sounds whales might be able to hear, we need to zoom into the tiny inner ear. The cochlea, a common feature in all mammals, is a fluid-filled spiral canal shaped much like a snail shell. Sounds enter the cochlea and vibrate the basilar membrane, which stimulates hair cells that send electrical signals to the brain. The stiffness of this membrane determines the frequencies to which the ear is most sensitive and thus what types of sounds the ear can perceive. I can estimate an animal’s frequency range by looking at its basilar membrane through a microscope. Baleen whales probably hear some of the lowest frequencies of all mammals. Their basilar membranes are wider, thinner, and floppier than those of other mammals, which makes them sensitive to low frequencies. I think my research on whale hearing is exciting in itself, but it could also lay the groundwork to go beyond dissections and test hearing in live baleen whales. Once we know more about how their ears work, we may be able to use a common hearing test called the auditory evoked potential method. This test is used in humans and other animals, including marine mammals. In the case of dolphins and porpoises, electrodes are embedded in suction cups that attach to their skin and record the brain’s response to sound. By monitoring dolphins’ brainwaves while presenting various types of sounds to them, we can figure out the limits of their hearing in terms of both range and sensitivity. 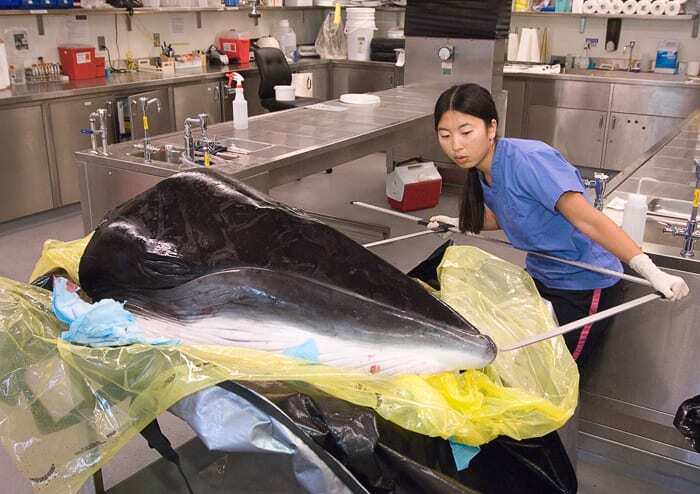 Baleen whales are much larger than dolphins and have very different head anatomy, requiring customized equipment and procedures. A better understanding of their auditory system would help us design effective electrodes, define their ideal placement, and give us a starting point for what frequencies of sounds we should test. With the help of my research, the application of auditory evoked potentials to baleen whales could yield quantitative data for the development of noise exposure regulations and other conservation measures in the future. And maybe someday, I will help a high school student study the effects of noise pollution on baleen whales. At sea. While swimming with whales. This research was funded by a National Science Foundation Graduate Research Fellowship, a WHOI Ocean Life Institute Graduate Fellowship, the Joint Industry Program, the Office of Naval Research, and the Operations Energy and Environmental Readiness Division of the U.S. Navy.